All Phase Restoration, operating out of Northern Colorado, has successfully raised over $20,000 for Local Charities in the wake of the recent Colorado Flood Season. Their goal is to put forth a concerted effort towards relieving the suffering of the community they are a part of. All Phase Restoration, with offices in Denver, Windsor, and Frederick Colorado has reached its annual goal of $20,013 in charity drives and has donated the money to local flood relief efforts. All Phase Restoration provides 24 hour emergency service to homes in businesses in times of floods or fires – so it does much business in times of disaster. The company may benefit financially from disasters, but tries to give back and benefit the community in many ways. In addition, the company has recently sponsored the Cooper 5k run at The Ranch in Loveland, benefitting those affected by Kawasaki disease. Kawasaki disease cause vascular inflammation primarily in infants and young children. This disease, like many others can be treated especially when diagnosed early. All Phase Restoration was proud to have been a part of that. In 2013, All Phase Restoration made a goal to donate $20,013 to local water related charities and had achieved their goal by the end of September. They made donations to those charities and diverted the money they raised in October to breast cancer charities. Any monies received in November and December will also go to water related charities. All Phase Restoration wants to thank all of the generous donors. 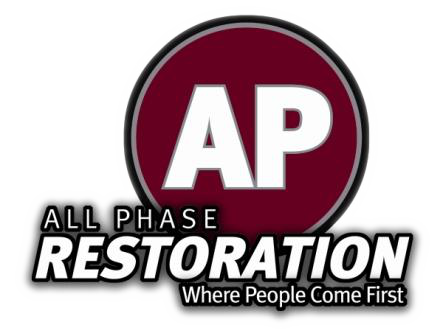 All Phase Restoration is one of Northern and Central Colorado’s busiest restoration contractors. They provide 24 hour emergency services in times of floods and fires. They also do mold remediation, roofing, demolition, and environmental monitoring. They were particularly busy during the recent floods that devastated many counties in Colorado, and continue to be busy as people rebuild. All Phase Restoration also provides ongoing education to Colorado and Wyoming insurance adjustors and agents, and property managers concerning disaster claims, emergency preparedness, and related issues. They strive to make these classes informative and entertaining. Also, All Phase Restoration offers free emergency preparedness consultations to businesses. This is a fantastic service the company offers and there is absolutely no cost or obligation involved.